Well, with an ‘h’ and without a bike, I guess. It’s really nothing like biking at all, in fact, but you can climb mountains while doing it so it can’t be all that bad. 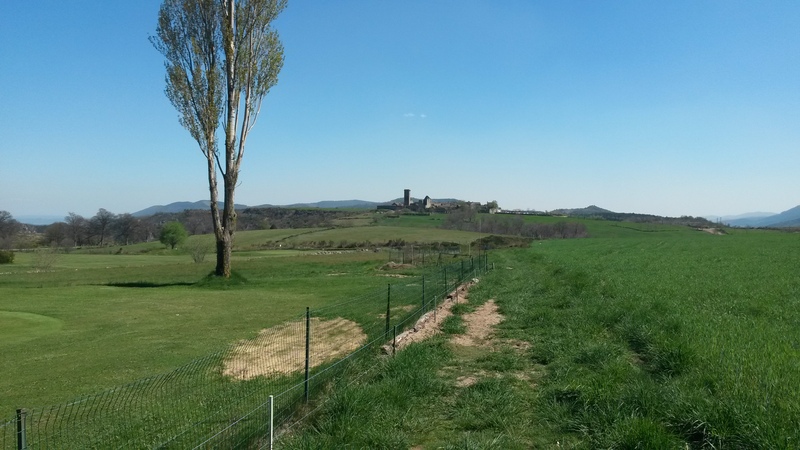 Shoko and I did our first multi-day hike in France (unless you count this 5-week one that did start on the French side of the border) last week, and I was reminded again what a nice way walking is to spend the day. It comes in a close 2nd in the contest for ‘travelling from A to B’, with train being a distant 3rd. The pace of walking is such that it allows you, literally, to stop and smell the roses. On my ride today I saw a couple of fields of bright red poppies, but I didn’t stop. If I’d been walking I could have. You get the idea; it’s different, and probably the reason I’m posting a bunch of hiking photos for a change. 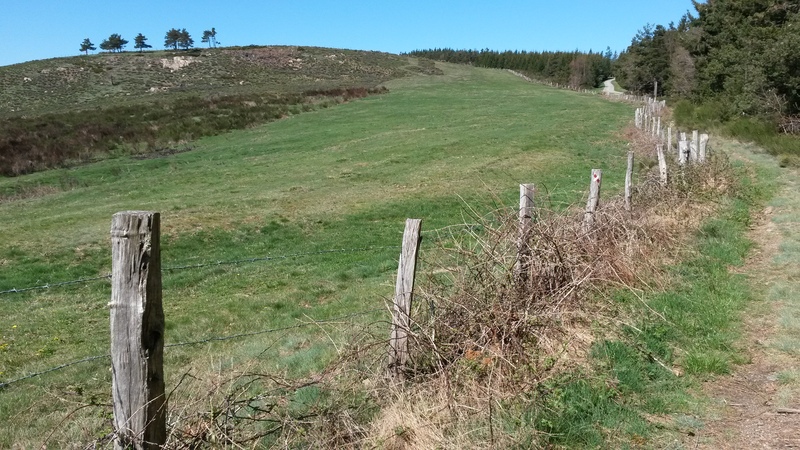 We chose a part of the Chemin de Régordane, otherwise known as the Chemin Saint-Gilles. It is an ancient route, with at least 1200 years of history. The route connected the Ile-de-France (Paris, basically) with the Mediterranean, and was used by merchants, pilgrims (on their way to Saint Gilles and/or the Holy Land), and probably more than a few crusaders, too. 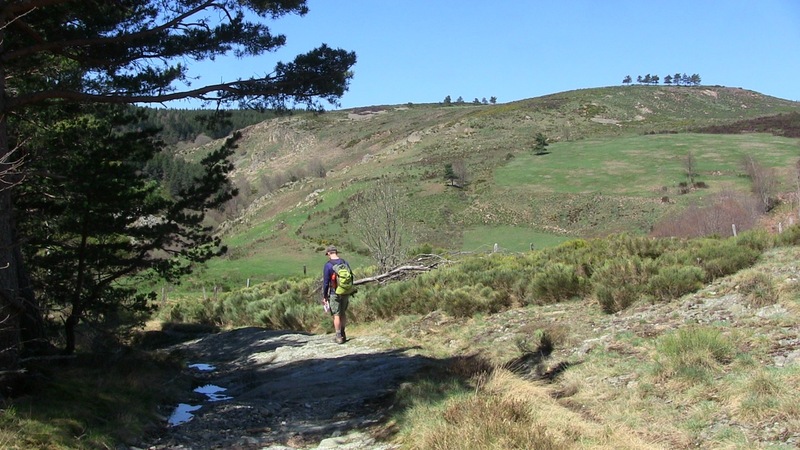 Today the Chemin de Régordane is a long-distance hiking trail called the GR700 (GR stands for Grande Randonnée – France is criss-crossed with them). Below is the tiny person-less (a big uproar over this is happening all along this famous line) train station of Genolhac. This train line is potentially on its last legs, and is certainly losing money. 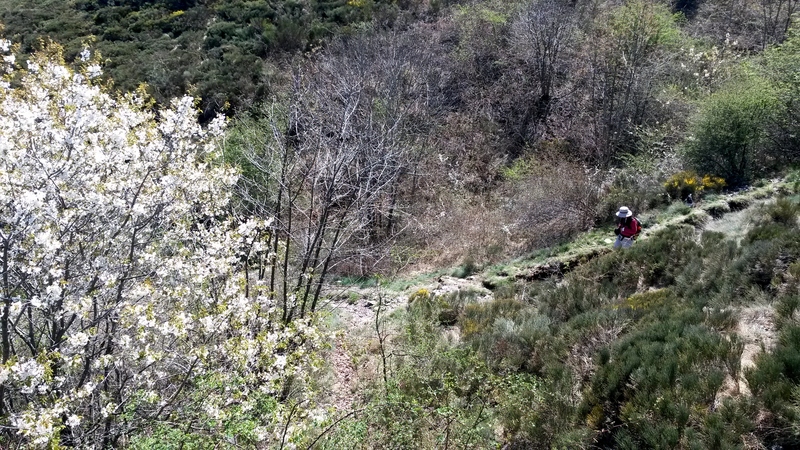 Still, it has great tourism potential (it cuts right through the Cevennes) and is used by hikers and bikers alike. We definitely don’t want to see the end of it. 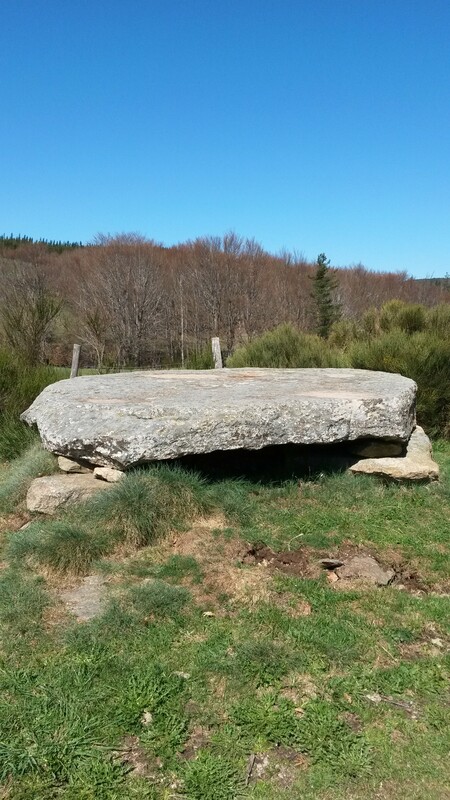 A dolmen, probably 5000 years old. 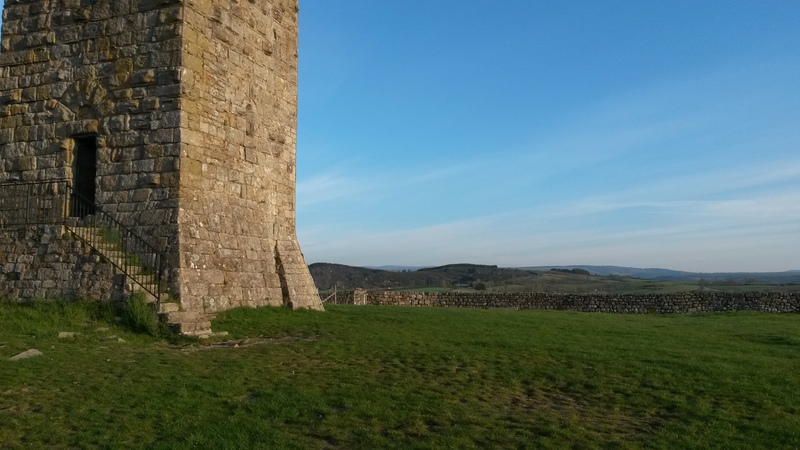 Whatever its original purpose, it’s now a great spot to have an apple, or maybe shake some pebbles out of your boots. 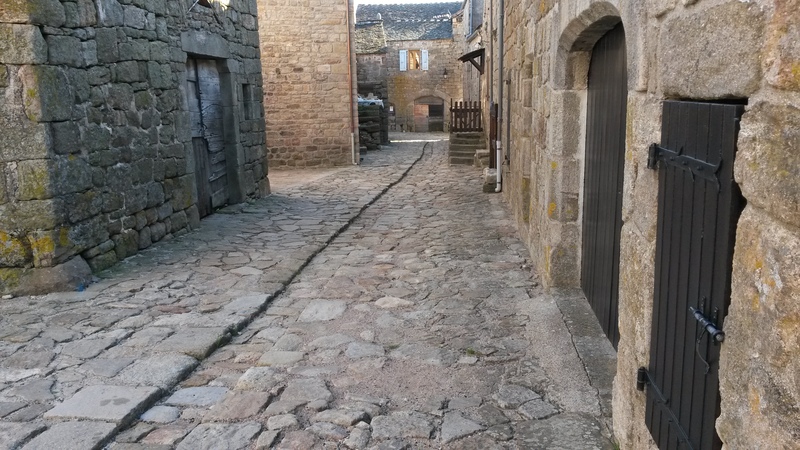 These ruts were cut into the stone to act as ‘rails’ for Medieval carts. How cool is that? 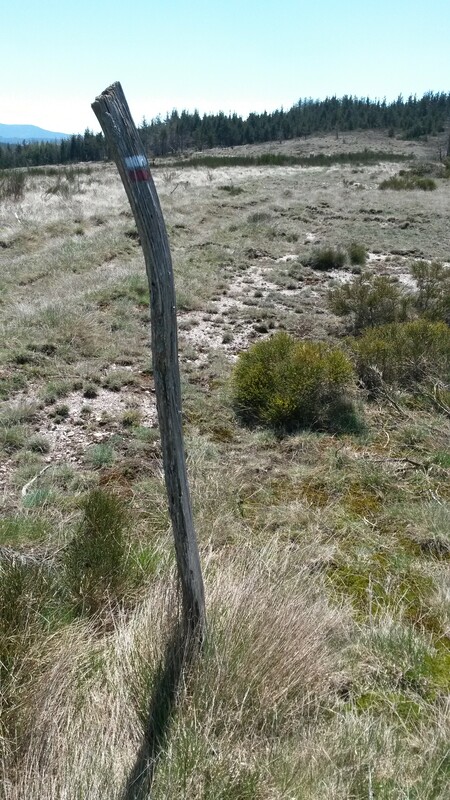 A precariously placed GR marker. Most of them are on trees and rocks, but this one seemed sort of frivolous anyway. There was only one way to go. Our home for the night – La Garde Guérin. If you like villages with serious atmosphere, this is one for you. It is a very well-preserved walled village, sitting, as you can see, in the middle of nowhere (a high plateau of around 800 meters). 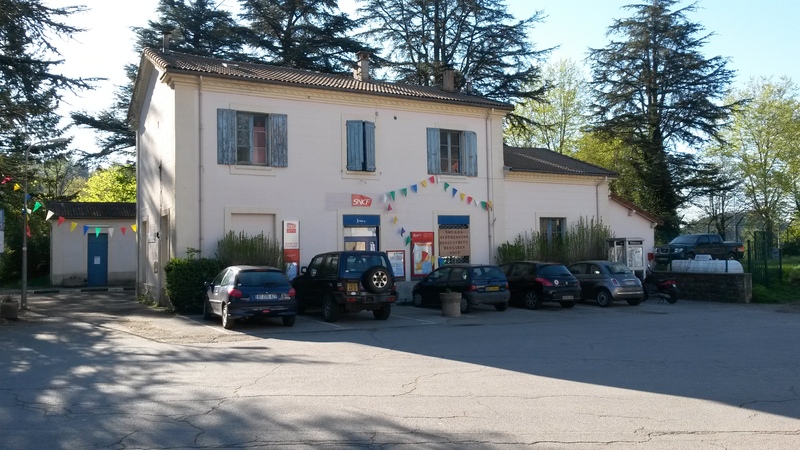 It also happens to be a village 44|5’s HighRoad Cévennes tour stops at for two days. There’s one hotel in town – a Medieval baronial mansion, of course. 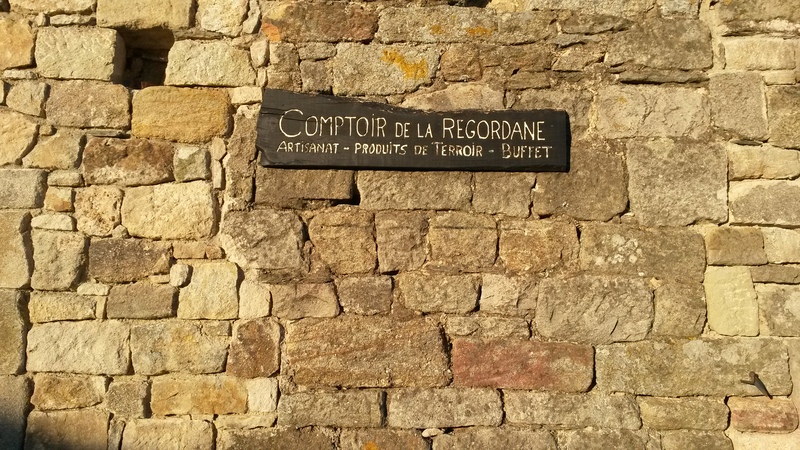 Along with the one hotel, there’s one shop: the Comptoir de la Régordane. They serve salads and snacks and have a large range of great local products. Oh, the guy who runs it is a bit of a beer connoisseur, too, so cold, local craft beer is right there for the taking, too. It’s a hard shop to leave. 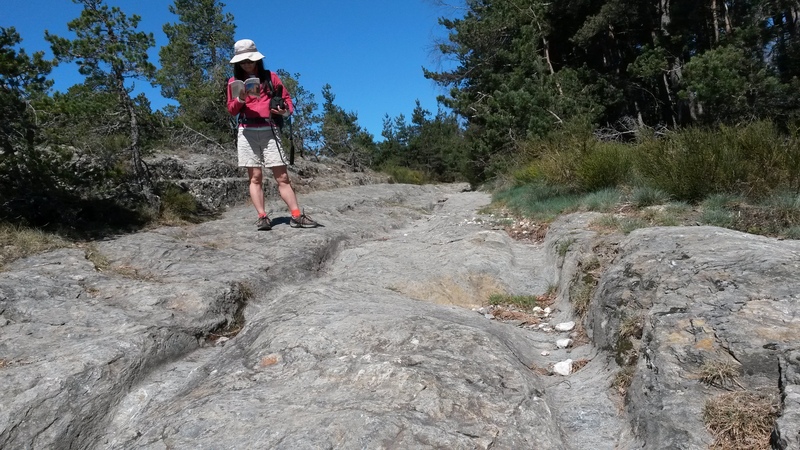 Morning of the 2nd day, descending the plateau down to the ‘real Cévennes’. 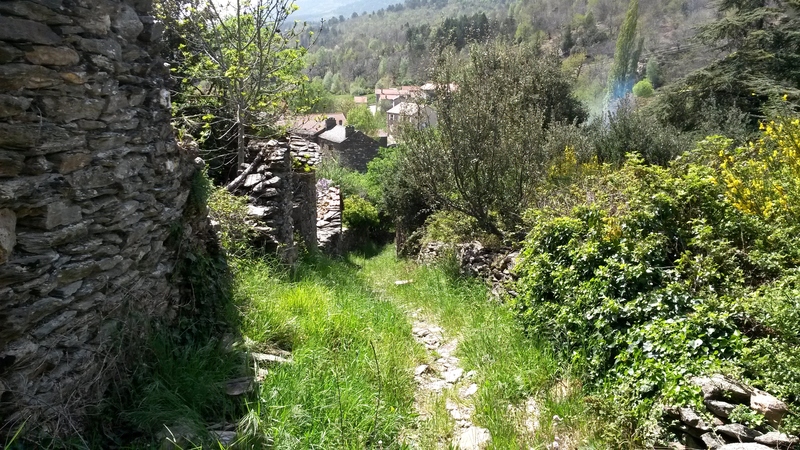 Entering a typical hamlet of the southern Cévennes. 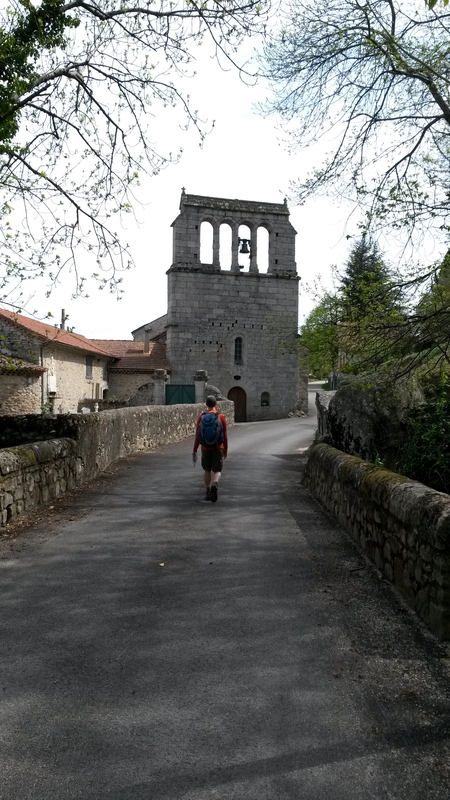 Walking through the village of Concoules, near the end of the day. The bike will return soon. Now I have had my knee fixed, I am enjoying walking again….but it does take you a long time to get anywhere. It does, but it’s surprisingly enjoyable. I’ll try it again. Yeah, the irony is great, isn’t it? Makes me (almost) want to go for a hike…. And your photos make me want to see the Cevenes in the springtime, for sure. How did you handle your car….or whatever…..starting the hike in one place and finishing in another? Hiking, biking, boutique beers, wines. Ahh, c’est la vie. Yeah, it had all the elements of a good couple of days. Agreed. this sounds like a great trip for us next year. along with a flat bike path from Montpellier to the Med that (I think) suze mentioned in a blog post. hiking AND biking for me! It’s a wonderful walk, Rebecca. Hopefully by next year I’ll have a few more ideas for you, too. We’re planning on heading back in again soon. Hi Rebecca, I did write about a flat ride, that I learned from Gerry…very easy, very nice, very fun. Pay attention to which way you go (depending on what you want) at Palavas. I had absolutely, vraiment, no idea you were reading my posts, though I know your name through Gerry. Are you in NYC? I once lived there, my husband used to, long long ago, work at the Met. Not the museum, the opera. Fun to, in a round-about way, hear from you. hi Suze! Thanks for the reply, and yes, of course I live in NYC, and um…did Gerry mention that I sing at the Met? What a coincidence if he did not. Sorry to take over your comment thread Gerry….. Yes, Gerry did mention that you sing at the Met, which is why I mentioned it, without knowing how public you prefer to be in the blogosphere. So we’re both sorry about taking over your comment thread …. but it’s fun, thanks Gerry!